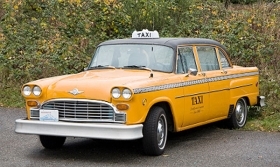 The one-time maker of vintage Checker taxi cabs has filed for bankruptcy. Checker Motors Corp., the auto-parts maker that once produced the Checker taxi cab, has filed for Chapter 11 bankruptcy while another Michigan supplier closed its doors. Checker sought court protection Friday, Jan. 16, in U.S. Bankruptcy Court in Grand Rapids. The 87-year-old Kalamazoo company has 246 employees and makes metal stampings and welded assemblies. It stopped making cabs more than 25 years ago. Also on Friday, electronics supplier May & Scofield LLC shut down after Bank of America foreclosed on its U.S. assets, the Associated Press reported Sunday. The 74-year-old company in suburban Lansing had awaited an Oct. 1 sale that collapsed with the crisis on Wall Street, the AP said. Checker joins seven other major U.S. suppliers that filed for bankruptcy protection in the past year, which saw the lowest U.S. auto sales since 1992. At least 54 major U.S. suppliers have filed for protection this decade, including three companies that filed twice, according to an Automotive News tally. Checkers filing cited rising raw material prices, the falling market share of its automaker customers and a desire to lower wages uncompetitive with already bankrupt suppliers. A year of labor talks has failed to produce wage concessions from its unionized employees, COO Mark Walburn said in court papers. Checker reported 2007 net sales of $63.4 million and expected to post 2008 sales of $61.5 million, court documents said. Checkers customers include General Motors, Ford Motor Co. and Chrysler LLC, according to its Web site. In its bankruptcy documents, Checker listed assets of $24.5 million and liabilities of $21.8 million, including $3.4 million in unsecured trade debt. It has 2,100 potential creditors. Its largest unsecured debt is a $1.5 million obligation to Walker Tool and Die Inc., of Grand Rapids. Other unsecured creditors include Alcoa, the city of Kalamazoo and U.S. Securities Associates, along with health care and life insurance companies. Checkers bankruptcy filing was reported earlier by Bloomberg News.